The stock market performance in 2018-19 was completely opposite to 2017. The year started with positive momentum and Sensex has hit a record high in August 2018. But the momentum disappeared for a few months after that. Trade war, Interest rate war and multiple other eco-political crises cause Sensex to pull down. After Budget 2018, Sensex again gain momentum and the Bull Run continued. In the year FY19, Sensex logs best yearly gain compared to the last four fiscals. The BSE Sensex rose 17% in 2018-19 while NSE Nifty gained 15%. BSE Sensex was trading at the level of 32969 on 27th March 2018. 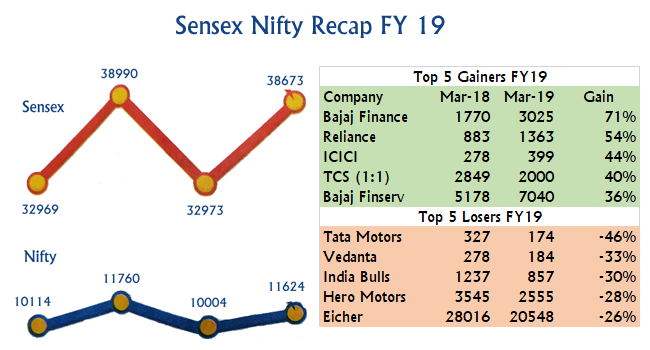 The Sensex touched 38672 on 29th March 2019. Thus the effective change in Sensex was 17.28%. In Sensex pack, the company which gave maximum returns were Bajaj Finance (71%), Reliance (54%), ICICI (44%), TCS (40%) and Bajaj Finserv (36%). The Sensex Stocks which could not perform in FY19 were Tata Motors (-88%), Vedanta (-51%), India Bull Housing (-44%), Hero Motors (-39%) and Eicher (-36%). We expect FY 20 to be a great year for the stock market. The Bull Run of the stock market is expected to continue in FY 20, which will be backed with the election result. After taking a look at Sensex and Nifty performance last year. 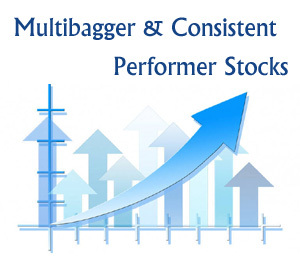 Let’s take a look at Few Multibagger and Consistent Performer Stocks. Although Sensex has given magnificent returns the performance of mid cap and small cap performance in FY19 was weak. It is the prime reason that number of multibagger stocks in 2018-19 were very less. Balaxi Ventures is the first multibagger stock of 2018-19. Balaxi Venture is rubber processing company. Balaxi Venture has generated 171% returns in the year 2018-19. Refex Industries is next in the list of multibagger stock of 2018-19. Refex Industries is chemical sector stock. Refex Industries has given 139% returns to the investors in the year 2018-19. Merck Ltd is pharmaceutical stock. Merck Ltd has generated 142% returns for the investors in FY19. It is high potential stock with very good fundamentals. IOC Chemical is next multibagger stock. IOC chemical is also from pharmaceutical sector. IOC Chemical has generated 137% returns in last one year. Usha Martin is one of the famous cable company in the India. Usha Martin stock has generated 100% returns to the investor in the year FY 19. MRO TEK is next in the list of multibagger stocks of 2018. MRO TEK Reality is real estate company in India. MRO TEK has generated 113% returns for the investor in 2018-19. 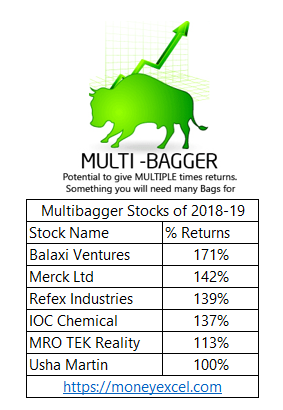 Note – Multibagger stock list of FY 19 given above is for reference purpose only. Please do not consider it as recommendation for investment. If you are planning to invest in stock market in the year 2019 here are 5 Consistent Performer Stocks of last 3 years (2016-19). A Consistent Performer stock means stock which gives consistent returns every year irrespective of market conditions. These type of stocks are an ideal choice for long-term and medium-term investors. These stocks will surely help you in wealth generation. Aarti Industries Limited is dealing in chemical and pharmaceutical business. The company has good consistent profit growth since past few years. Last year (2018-19) this stock has generated 35% returns. Bajaj Finance is leading finance company. Bajaj Finance is fundamentally strong company. If we see the historical performance this stock has given very good track record of posting higher profit and revenues. Last year Bajaj Finance has generated 71% returns. HDFC Bank is leading private sector bank. HDFC Bank has very strong fundamentals. This stock is able to deliver consistent performance every year. Last year HDFC Bank has generated 20% returns. Britannia Industries is one of the most popular food company in India. Britannia Industries has estimated 38% market share in biscuit, dairy and food products. This stock is consistently performing well. This stock has generated 21% returns in FY 19. Asian Paints is next in the list of consistent performer stocks. Asian Paints has generated very good returns for the investors in the past. Asian Paints is in the manufacturing of colour & home décor products. Last year (2018-19) Asian Paints has generated 30% returns for the investors. If you are planning to invest in the stock market you should consider consistent performer stocks for investment. Consistent stocks are safe stocks on which you can rely. Lastly, these stocks have performed consistently well that does not mean that they will continue to perform in the future. You should keep tracking the performance of the stock and make changes in your portfolio at least once a year. « 5 Digital Gold Purchase Options – How to Buy Gold Online?